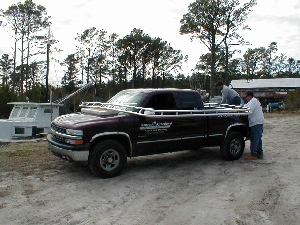 March 19, 2004 As we gladly wave goodbye to an especially dreary, cold winter, Cherokee is enjoying the finishing touches that will see her emerge into spring a new lady. 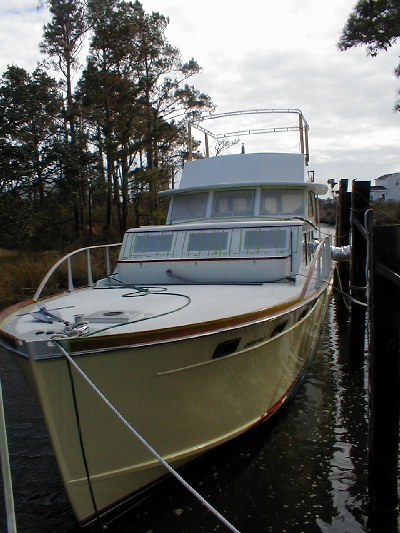 The folks at Hancock and Grandsons have been installing the flybridge half-tower. The first stage can be seen below. 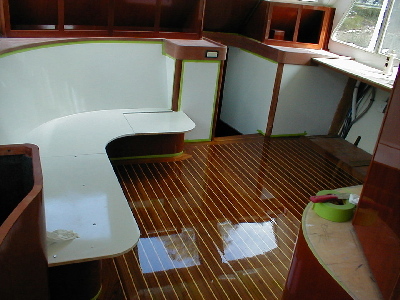 Under the flybridge, note that the windows are removed, as they are shoreside receiving the last coats of paint. Bottom left shows the innovative way portions of the half-tower were delivered to the site. To the right is the half-tower with cross supports and legs attached. 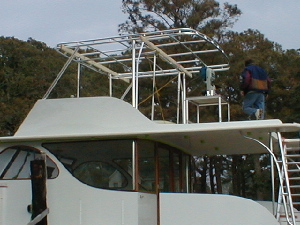 Next the whole business will be welded together, including upper deck handrails so nobody goes flying off into the wind. 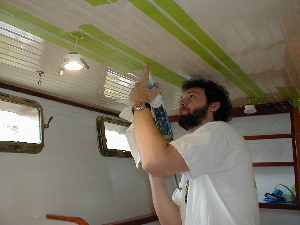 Mike Sasser of Coastal Canvas will soon install the vinyl top for a little shade. The wing doors are getting hinged to the wing walls. 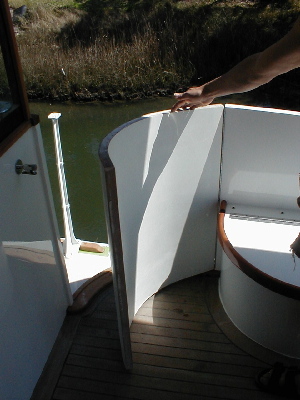 These doors are curved so when opened, they lay nicely against the deckbox seats. 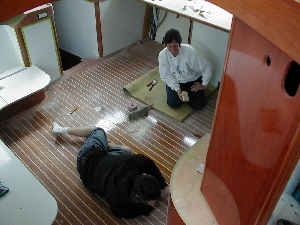 Sharon and her sweet son Aaron sanded the galley floor and applied the last few coats of varnish. Next they will apply the protective hardcover coat that will protect against high heels, dogs, cloggers, and soccer players. Meanwhile Eddie is keeping up with everyday maintenance. 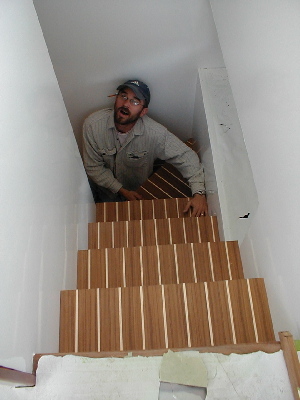 Here he is repairing cracks in the beadboard ceiling that occurred in the dry winter air. Eddie, an accomplished guitar player, enjoys listening to Widespread Panic while he works.